Former Foxboro standout Austin Ryan had a very memorable and impressive first year suiting up for the Bentley Falcons. After spending time at Williston Northampton School after graduating from Foxboro High. Ryan was named Northeast 10 Conference Rookie of the Week four times throughout the season, and was named NE10 Offensive Player of the Week in the final week of the season. He was second on the Falcons with 49 receptions but had almost more than triple the yardage of the next highest receiver on the team with 1,237 yards. He also hauled in a team-high and conference-best 16 touchdowns. His 123.7 receiving yards per game also led the NE10. Franklin’s Quintin McDermott also had a strong season for the Falcons. He recorded 34 tackles, forced a team-high three fumbles and came away with three pass breakups. He had two interceptions on the season, coming in the same game. He picked off Merrimack quarterback CJ Scarpa twice to help Bentley pick up a 17-7 win on the road against the Warriors. Attleboro’s Luke Morrison played in five games, Mansfield’s Kyle Wisnieski (six tackles) played in six games and Bobby Mylod, a freshman, played in all 10 games and made five tackles. Ryan wasn’t the only former Hockomock star to have a standout first year in the NE10. Former HockomockSports.com Player of the Year and Canton star Jake Ragusa was a monster on the defensive side of the ball for Merrimack. Ragusa led the Warriors with 70 total tackles, and was tied for the team lead with 4.5 sacks (for a total of 40 yards). He also had two interceptions from his linebacker spot, three quarterback hits, two forced fumbles and a fumble recovery. Lasy year’s girls’ soccer HockomockSports.com Player of the Year Hannah Reiter made an immediate impact for the Quinnipiac team this fall. Reiter was named to the Metro Atlantic Athletic Conference All-Rookie team. She earned a spot as the Bobcats’ primary defensive midfielder and racked up four assists in 17 regular season games (11 starts). Reiter increased her minutes played in all six games prior to earning a starting spot she has since not relinquished at Harvard on Sept. 13. Since Reiter joined the starting lineup, Quinnipiac finished the regular season with a mark of 5-3-3 while she played every minute in seven out of the 11 games she started in 2017. In addition, Quinnipiac allowed more than one goal in just three of the 11 regular season games in which Reiter was in the starting lineup. Joe Wilder, a former Stoughton standout on the gridiron, was named the Massachusetts State Collegiate Athletic Conference Offensive Lineman of the Year after a great senior year at Framingham State. Wilder, who was also selected to the MASCAC First Team All Offense, helped lead a Rams offensive line that first in the conference in rushing yards (2,044), rushing yards per game (204.4), rushing touchdowns (22) and rushing first downs (104). Wilder started at tackle for the Rams. Also at Framingham State, Attleboro’s Tom Burns earned Second Team All Defense honors after another solid campaign with the Rams. Burns, a senior, was third on the team with 54 tackles (most among defensive backs). He also recorded two tackles for loss while coming away with three interceptions (totaling 65 return yards) and three pass breakups. King Philip’s Brian Donahue had 14 tackles, including two for loss, while fellow former Warrior Cory Lombardo had five tackles and an interception. Taunton’s Trevor Wysong continued to pace Bridgewater State’s men’s cross country team again this season. Now a sophomore, Wysong helped the Bears finish second at the 2017 Massachusetts State Collegiate Athletic Conference (MASCAC) Cross Country Championships held at Stanley Park in Westfield. Wysong garnered All-MASCAC honors as he placed second overall at the meet, covering the eight-kilometer course in a time of 26:07.60. Taunton’s Dylan Lynch, a freshman, finished 41st overall and Attleboro’s Will McKenzie, a sophomore, was 80th. In the women’s race, Milford’s Jenise Madden, a sophomore for BSU, crossed the finish line fourth overall in a time of 19:39.50, earning All-MASCAC honors. She helped the Bears finish fourth overall. 2016 HockomockSports.com Best XI selection Colby Koch made an immediate impact on the pitch at Becker College. Koch was second on the team with four goals and had a team-high four assists, resulting in 12 points during his rooking campaign. He had a team-high 26 shots on goal, and three of his four goals were game-winners. At Bridgewater State, former Oliver Ames football star Cam Williamson wrapped up his collegiate career with 34 tackles from his defensive back spot. Williamson, who played in eight of 10 tames, averaged 4.3 tackles and a game, had a fumble recovery in a win over Westfield state, had an interception on the road at Fitchburg State and totaled five pass breakups. Down at Mass. Maritime, a handful of former Hockomock League standouts are factoring to the Buccaneers’ defensive unit. Mansfield’s Alex Ruddy was second on the team with 47 tackles, including two for a loss. He also came up with one interception, two pass breakups and three passes defended. KP alum Leo Munafo had 22 tackles, an interception, and two pass breakups, Mansfield’s Connor Finerty had nine tackles in six games played, KP grad Chris Winbourne had four tackles, former Sharon standout Peter Banks had three tackles, and James Cooke (an offensive lineman) had one tackle. Kim McNally had her best offensive season during her senior campaign with the Sacred Heart women’s soccer team. McNally, a defender, was one of just four players on the team to start in all 18 games. And even has a defender, she finished third on the team with three goals scored. The former Canton Bulldog scored on the road at Yale, scored the game-winning goal at home against Mount St. Mary’s and added a third tally on the road at Wagner. She finishes her career with six goals and one assist, playing in all 73 games that happened during her four-year career – starting all but four of them. Mansfield’s Alyssa Kelly finished second in both assists and digs for the Bridgewater State volleyball team. Kelly had 116 sets, averaging 1.15 assist per set. She added 187 digs (1.85 per set) as well as 27 kills and 24 aces (third on the team). Against Lasell, Kelly had a season-high 15 digs while notching a season-best four aces just a week earlier against Worcester State. Brandies men’s soccer is in the midst of another successful postseason run, with two former Hock players leading the way. Josh Ocel has a team-high 10 assists along with four goals, leading the Judges with 18 points. Ocel, along with King Philip grad Andrew Allen, are just two of nine players to see action in all 19 games this year. Allen has been a weapon off of the bench, making 12 appearances as a substitute. He’s second on the team with five goals and also had three assists during his junior season. Attleboro’s Michelle Sheehan set the offense in motion for Mass. Maritime’s volleyball team this fall. Sheehan, a sophomore, posted a team-high 307 assists (3.30 per set) and was also a top defensive option for the Bucs, notching 129 digs. Along with 41 kills, she had 24 aces. She had a season-high 24 assists on the road at Pine Manor and a season-best 12 digs on the road at Fitchburg State. Former Foxboro Warrior Katie Notarangelo finished her collegiate career with her best offensive season in four years with MIT’s field hockey team. During her senior season, she scored a career-high seven goals along with a career-high five assists for 19 points, which was top five for the Engineers. She finished her career with 11 goals and six assists for 28 points while starting in 66 of the 69 games she appeared in over four years. Franklin’s Alexis Stowell earned Northeast-10 All-Conference Third Team honors after another successful year with the Assumption women’s soccer team. Stowell helped anchor a defensive line that posted five shutouts on the season, including a huge effort against Saint Rose in the NE10 Quarterfinals. She also recorded three assists playing right back for Assumption, including producing the game-winning assist in the Hounds 2-1 win over Le Moyne on October 11th. Twin sister and former HockomockSports.com Player of the Year Victoria Stowell scored once and had two assists with 18 games started for the Greyhounds. Former King Philip standout Melissa Daigle finished her collegiate career with an even 800 kills for the WPI volleyball team. She had a career-best 266 kills her freshman year, and finished with 167 during her senior campaign. She also had 565 career digs, 48 aces and 79 career blocks. Two of Bridgewater State’s three field hockey all-conference honorees hailed from the Hockomock League. Mansfield’s Janet Maher was named to the All-Little East Second Team and Foxboro’s Emma Daly, a freshman, earned honorable mention honors. Maher, who hails from Mansfield, Massachusetts, started all 17 games on the Bears’ back line this season. She tallied four goals and one assist for nine points to go along with a defensive save. In 70 games over four seasons with the Bears, Maher recorded six goals and three assists for 15 points in addition to six defensive saves. Daly put together a solid rookie campaign as she notched eight goals and three assists for 19 points. Another former Hockomock field hockey player that Little East honorable mention honors was Franklin’s Allison Burke. Burke was the stingiest goalkeeper in the conference, sporting an .824 save percentage that slotted her atop all LEC netminders. The junior shattered her previous season-high for saves, stopping 168 shots in 2017, logging four shutouts with a 2.57 goals against average. UMass Dartmouth’s season-opener against MIT on Sept. 2 was a sure preview of Burke’s outstanding season; she set NCAA Division III’s highest single-game save total of the season with 37, holding the Engineers to just four goals and breaking Seana Golden’s previous school-record of 29 saves. Anthony Barreira worked his way into the starting lineup by the midway point of the season for Bryant University’s men’s soccer team. Barreira started in six straight games, including both of the Bulldogs’ wins this season. He scored his first collegiate goal at home on October 22nd, netting the opening strike in a 2-1 win over Sacred Heart. Brett McEvoy became Nichols all-time leading tackler (385) this season and earned his fourth Commonwealth Coast Conference all-conference nod and second First Team selection. He led the Bison and finished second in the conference in tackles with 115 (41 solo) and recorded 10-or-more tackles in seven contests, including a season-high 15 against Westfield State and Endicott. He also led the CCC in fumble recoveries (four) and collected seven tackles for loss. He also owns several punting records at Nichols, including punts (207) and yards (7,237). Mansfield’s Kerra Anastasia concluded her four-year career with Fitchburg State field hockey with her highest point total during her senior season. Anastasia scored a pair of goals for the Falcons, scoring her first of the season in a rout on the road at Becker, and netting her second in a comeback win against Southern Maine. She finishes her career with three goals and six assists, for a total of 12 points. At Regis College, Stoughton’s Ashley Chipman was the leading scorer for the Pride’s field hockey team while Oliver Ames’s Yvonne Abate was in the top five in scoring from her midfield position. Chipman, who played forward, notched a team-high five goals to tie for a team-best 10 points this season. Abate, who started in 14 games this season, scored twice and had two assists to finish with six points. Former Attleboro Bombardier Owen McKenna handled punting duties for the Norwich University team this season, along with getting reps on the defensive side of the ball. In 10 games played, McKenna booted 60 punts, averaging over 35 yards on each kick with six kicks inside the 20-yard line and only one attempt blocked. On defense, the sophomore had 22 tackles. At Bard College, Franklin alum Nicole Ellin appeared in all 17 games as a junior, starting 16 of them. She totaled 1,316 minutes played, which was fourth on the team, finished with a shot on goal, and was a rock in the middle of Bard’s defense at center back. Another Franklin grad, Meghan Dieterle, became a mainstay on Saint Michael College’s backline. She started in 16 games, and even scored a pair of goals (including the game-winner on a free kick in overtime against Post). Sharon’s Tim Peng notched his first collegiate goal during his senior season at Trinity College. Peng, who patrolled the midfield for the Eagles four years ago, concluded his college career with his best season. He appeared in a career-high 14 games, along with seven starts. He scored his first goal – the game-winner – in a 1-0 win on the road at Western Conn. State. Danny McDermott made the most of his senior year, starting under center for Salve Regina. He finished the season with 1,892 yards, 22 touchdowns through the air and an average of 210.2 passing yards a game. He completed 55.8% of his 258 attempts. Attleboro’s Tyler McGovern, a freshman, was McDermott’s backup and completed two of his four attempts for 32 yards. One of those completions went for former Bombardier teammate Brendan Nunes, who was second on the team with 34 receptions, totaling 432 yards and hauling in seven touchdowns. Nunes also had six kick returns for 142 yards and was third on the team in all-purpose yards. Foxboro grad Ronnie Martin, in his first year with the Seahawks, was third on the team with 96 rushing yards and scored a pair of touchdowns. Two former Mansfield Hornets earned All-MASCAC honors after solid seasons with the Bridgewater State women’s soccer team. Molly Sheild was named to the All-MASCAC First Team and Katie Bongarzone earned All-MASCAC Second Team honors. Shield and Bongarzone anchored an outstanding BSU defensive unit which limited opponents to just 6.7 shots on goal per game and helped produce seven shutouts and a team goals against average of 0.98. As a team, the Bears ranked second in the MASCAC in shutouts and third in goals against average. Bongarzone started all 19 games this season and finished with a goal and six assists, while Shields appeared in 17 games with 16 starts and recorded an assist. Taunton’s Alana Vincent finished with four goals and four assists in just eight games played for the Bears. Merrimack junior Mary McNeil was named to the Northeast-10 All-Conference Second Team for another solid season with the Warriors. McNeil, a former Canton standout added to her well-decorated career with another all-league selection. The two-time All-American posted totals of three goals, a team-best 10 assists and 16 points over 18 appearances. She ended the season in a tie for fourth in the conference in helpers, one of six players in the league with double-digit assists. She posted three multi-assist efforts in 2017, and a pair of four-point performances. Also at Merrimack, Canton’s Lindsey Nolte scored five goals and had two assists while Milford’s Jess Palmer scored once. All three started in all 18 games this season. There was another familiar face on the NE10 All-Conference Second Team, as former HockomockSports.com Player of the Year Hannah Friend, who now plays forward for Saint Anselm, was also selected to the team. Friend earned Second Team recognition by leading her team with 21 points of offense (9-3=21) against NE10 foes, scoring nine goals and three assists. Overall on the season, she notched a team-best 12 goals and seven assists for 31 points (12-7=31) and currently ranks 13th nationally in points per game (1.72). Another former OA standout, Kendall Clifford, was named to the NE10 All Rookie team. She led all Saint Anselm freshmen in 2017 by scoring three goals and as many assists for nine points. Making 16 appearances in a reserve role, Clifford has boosted a midfield that has scored more than four goals per game on eight occasions and has blanked its opponents in eight games as well. Franklin’s Maddie Bressler scored five goals and added two assists and Canton’s Mary Nee had three goals and five goals for the Hawks. Former Stoughton standout Malachi Baugh concluded an injury-riddled career at Stonehill with his best season. After being limited to 27 carries through his first three years, Baugh was second on the Skyhawks with 96 carries this season and totaled 472 yards (52.4 per game and five touchdowns. He scored a touchdown in five of his last six games, helping Stonehill go 4-2 in those contests. Luke Albertini concluded a four-year career at Central Connecticut State. The former Red Rocketeers started in 56 games over his four years, including 17 in each of the past two seasons. He made 63 appearances in total for the Blue Devils, patrolling the midfield. He scored a pair of goals, one as a freshman, and one as a junior. Taunton High grad Adam McLaughlin hauled in a pair of touchdowns in his rookie year at UMass Dartmouth, finishing fifth on the team in receptions with 14. He scored his first touchdown of the season in the second game of the year, hauling in a 10-yard touchdown. He had a season-high four catches for 66 yards in a win on the road at Mass. Maritime and then scored his second touchdown of the season in the finale at Fitchburg State, a 29-yard reception in the third quarter. Also at UMass Dartmouth, Attleboro’s Andrew Gingras started all 10 games at left tackle during his freshman season. Lauren Berman capped a rollercoaster ride of a collegiate career with a great final season with the Boston College women’s soccer team. Berman finished second on the squad in points this season, scoring a team-high seven goals while adding three assists for 17 points. She started in all 20 games this season and was fourth on the team in minutes played. She was named New England Soccer Journal Midfielder of the Year. She finishes her BC career with 14 goals and 15 assists. Former two-time HocomockSports.com Player of the Year Taylor Cogliano finished the season fourth in scoring for the Merrimack Warriors. Cogliano made 12 starts, and a total of 19 appearances as the Warriors reached the NE10 semifinal game. 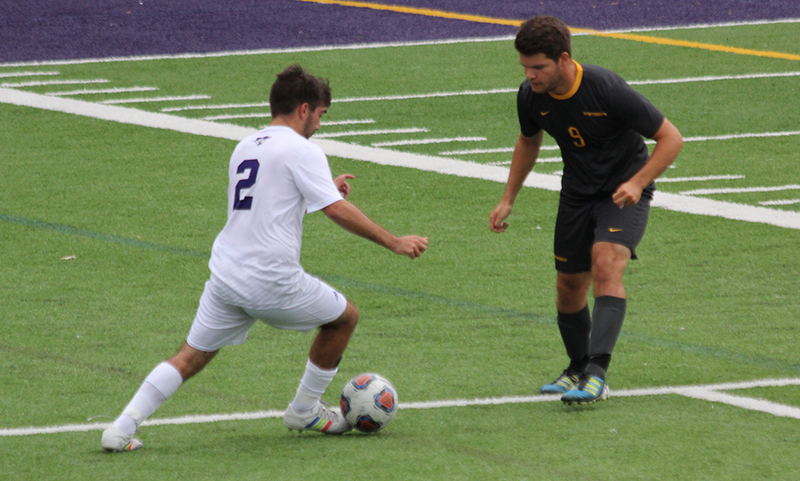 The former Frankin star scored a pair of goals – one against Molloy and one against Le Moyne – and finished with two assists (against Dominican and Stonehill). Milford’s Nicole Dahlgren made six appearances off the bench for the Warriors this season. King Philip grad Joe Kellett continues to be a mainstay in the midfield for the talented UMass Lowell men’s soccer program. After starting in all 16 games as a freshman, Kellett was just one of three River Hawks to start in all 18 contests in 2017. He was second on the team in minutes (1,670), and had one assist on the season. He set up a goal in UMass Lowell’s 3-2 win at home over Monmouth. Elias Camacho, a former Canton gridiron standout, concluded his career at Wesleyan fourth on the team in tackles. He had 26 solo tackles, and 35 total tackles, including two for a loss. He also had an interception in the final game of the season – his third career pick – and had five pass breakups. For his career, Camacho finished with 67 tackles and 3.5 tackles for loss. After just one appearance during her freshman campaign, former Franklin standout Dani Lonati lead the Colby women’s soccer team with eight starts in net and nine total appearances. She posted 48 saves with an impressive 1.42 goals against average, earning a shutout win on the road against Thomas. Lonati made a career-high 13 saves in a scoreless tie to open the season against Tufts. Franklin’s Sammy Rondeau was named to the Great Northeast Athletic Conference Field Hockey All-Conference Second Team after a strong season with Simmons – her second straight year on the second team. The senior enjoyed the best season of her career, racking up 40 points to rank sixth among GNAC players, while scoring 16 goals to stand fifth and recording eight assists for the fourth-most in the league. The forward’s four game-winners place her fifth among GNAC leaders. The former Panther’s season was one of the best in school history with the fourth-highest point total in school history, the fifth-highest assist count and the sixth-most goals in a season at Simmons. She started all 19 matches for the Sharks and was named the GNAC Player of the Week as well. Milford’s Eric Nunez had a strong senior season for the Worcester State football team. From his linebacker spot, he finished fifth on the team with 44 tackles and had a team-high four sacks, and six tackles for loss. He also forced two fumbles and recovered a fumble as well. Mansfield grad Aurian Dawkins had 12 tackles during his senior year, as well as a fumble recovery and a pass breakup. Former Red Rocketeer and New England Revolution academy standout Justin Freitas wasted little time making an impact at the University of Vermont. After spending time at Dean College, Freitas scored eight goals and had three assists while starting 13 games for the Catamounts. Freitas had a pair of goals in a 3-1 win at home against UMBC and again notched two goals two games later in a 2-3 setback at home against Northeastern. For the third time in four years, Franklin graduate Joe Kalil was honored by the Commonwealth Coast Conference. Now anchoring Wentworth’s defense, Kalil was named to the all-conference second team for his strong 2017 campaign. Kalil earned honorable mention during his freshman year, and was named to the first team a year ago. In 2017, Kalil started 20 games and picked up a pair of goals. He finishes inside the top 10 all-time in program history in starts. Alex Jette had his collegiate career come to an end this Fall but wrapped things up in memorable fashion. A four-time First Team All-Ivy selection, Jette was named a First Team All-Ivy wide receiver and return specialist in 2016. Jette will go down as one of the top receivers in Brown football history, finishing his Brown career ranked ninth in both career receiving yards (1,860) and receptions (150). He was also a playmaker on special teams; Jette had a 79-yard punt return for a touchdown against Cornell and ranks fourth all-time in career punt return yards (493) at Brown. He had h 54 catches for 518 yards and three touchdowns during his senior year and was also named to the 2016 All-New England Football Team. A pair of Framingham State Rams and former Hockomock football players were named to the Massachusetts State Collegiate Athletic Conference Second Team. Attleboro’s Tom Burns and Stoughton’s Joe Wilder both earned the honor after leading the Rams to a 7-3 regular season. Burns, a defensive back, was second on the team in tackles with 67 (40 solo), had two tackles four loss and four pass breakups. Wilder has been a starter on the offensive line for two years now and helped pave the way for the offense. At left tackle, Wilder was a big reason the Rams rushed for over 2,000 yards. A handful of former Hockomock players saw playing time for Mass. Maritime this season. Manfield’s Alex Ruddy was the most productive defensive player, registering 27 tackles, including two for loss, and had a pass breakup. Milford’s John Niro had five tackles, one for loss, Mansfield’s Connor Finerty also had five tackles and Canton’s Joe Bires made three tackles. Sharon’s Adam Banks, an offensive lineman, played in five games, even hauling in a pass. King Philip’s James Cooke (guard) and Chris Winbourne (tackle) started on the offensive line for the Buccaneers. Former Milford three sport athlete Jarrod Casey capped an impressive career at Assumption with a stellar senior season. Casey, who was selected NE-10 First Team Defense for the second straight year, led the Hounds with 90 tackles and was the only player in the NE-10 with at least two sacks and two interceptions. He finished with 2.5 sacks and three interceptions while breaking up three passes. Stoughton’s Brandon Swain-Price finished his sophomore year with 18 catches for 349 yards and three touchdowns. North Attleboro’s Eric Beckwith also received NE-10 honors, being tabbed First Team Offense for the second straight year. Beckwith has been making an impact for the Falcons since his freshman year. The former Rocketeer played in 41 of a possible 44 career games, with 35 starts. King Philip’s Sam MacDonald has also beeing a cornerstone for the Falcones for four years, playing in 43 of 44 possible games. The KP alum finished his career with 17 interceptions, one shy of the Bentley record and one of the top five totals in Northeast-10 Conference history and was named to the CoSIDA Academic All-America Football Team. Oliver Ames graduate Cameron Williamson was a big piece of Bridgewater State’s football team this Fall. In 11 games played, Williamson was tied for fifth on the team with 42 tackles and was among the best on the team with 36 solo tackles. He had one interception, six pass breakups and two fumble recoveries for the Bears. Franklin’s Brandon Eccher was named to the Liberty League Football All-Conference Second Team while Stoughton’s Dan Eckler received honorable mention honors. Eccher was second in the Liberty League with 72 points (12 touchdowns). He posted 777 yards on 45 catches with 11 scores. As a punt returner, Eccher picked up 160 more yards on 17 tries with a 78-yard TD against Union. He ends his career third in the WPI record book with 132 career receptions and fifth in career receiving yards with 1,949. Eckler was one of the top four quarterbacks in the league this season. He amassed 1,900 passing yards on 118 completions with 18 touchdowns and the best efficiency rating of 166.8 in eight contests. Eckler also rushed 76 times for 235 yards and four scores to rank in the top 20. In 29 games, he piled up 5,571 yards on 404 completions with 44 touchdowns in the air and 783 yards on 266 rushes and nine touchdowns on the ground. His name is currently first in the WPI record book with 6,534 career yards of total offense (passing and rushing) and career passing yards, as well as third in career attempts (704) and completions. King Philip’s Christian Vellante finished with 37 tackles, good for seventh most for Curry this season. Of his 37 tackles, 24 were solo takedowns, he had two tackles for loss, registered one fumble recovery and had one reception on offense. Over two years, Vellante had 78 tackles for the Colonels and seven tackles for a loss. Former Franklin standout Craig Anderson became the first ever Endicott player to earn CoSIDA Academic All-America Honors twice. After being rewarded last season with the same honor, Anderson was back again this season with a 3.89 cumulative grade point average in the classroom and 28 tackles (15 solo), four sacks, two quarterback hurries and a blocked kick on the football field. Anderson, who earned All-New England Football Conference first team honors for the second straight year, finished his career with 21.5 sacks, second-best in school history, while recording 204 tackles (95 solo) and 40.5 tackles for loss. Former Mansfield Hornet James Comer received Eastern Collegiate Football All-Conference honors after a strong senior season. Comer was named to the All-Conference First Team for the first time in his career, after posting 36 tackles – 4.5 of them for a loss – recovered a fumble and had 1.5 sacks. Former King Philip linebacker and current Nichols standout Brett McEvoy was named to the New England Football Conference ALl-Conference Second Team. McEvoy was second in the conference in tackles (94) and notched five games with at least 10 tackles, including a 16 tackle game against MIT. The junior also recorded 9.5 tackles for a loss and had two interceptions. Attleboro’s Brenden Massey was second leading receiver for the Bison, hauling in 41 catches for 759 yards and six touchdowns. Attleboro grad Brendan Nunes enjoyed a successful rookie campaign at Salve Regina. The former Bombardier playmaker was all over the field for the Gull. He caught 10 passes for 183 yards and a team-high five touchdowns. He had two carries for 12 yards and was a primary return man – taking 11 kick offs for 276 yards and a touchdown and pulling down seven punts for 58 yards. Franklin’s Danny McDermott was a versatile option for the Gulls, completing 9 of 11 passes for 113 yards, rushing for 26 yards and even catching a 20 yard pass. Trinity senior defensive back Paul McCarthy earned All-New England Small Colleges Athletic Conference First Team honors for the second straight season. McCarthy, a former North Attleboro Rocketeer, was a key piece for the Bantams with 27 tackles, three interceptions and five pass breakups. For his career, McCarthy had 84 tackles and an impressive nine interceptions. A pair of former Taunton players and current UMass Dartmouth teammates were honored by the Massachusetts State College Athletic Conference for their strong seasons. Austin Peters, a starting guard, helped anchor the Corsairs to a record breaking year and was named to the MASCAC First Team. UMass Dartmouth recorded 4,641 yards on offense – a school record. Marcel Flynn was named to the MASCAC Second Team after posting a career-high 40 tackles in his fourth year as a starter. Flynn was also a force on special teams as he registered a career-high and MASCAC-best four blocked kicks in 2016. Mansfield’s David Collins finished second on the team with 80 tackles with eight tackles going for a loss. Former Attleboro goalie Spenser Powell was named to the 2016 Division II Conference Commissioners Association (D2CCA) All-America Second Team following a strong year for Adelphi. Powell was among the best in the nation in both goals against average (0.498) and save percentage, stopping 86.8% off all shots on goal. Read more about Spenser here. Taunton’s Dan Belair finished his career at American International College, registering his first career point in his senior season. Belair started in 33 games over his four year career, including four in his final season. He picked up his first assist in a 5-0 win over Bentley in October. Not many players have seen more minutes over the past four years for Assumption men’s soccer than Franklin grad Zach Scafati. The inaugural HockomockSports.com Co-Player of the Year, Scafati started in 63 games (of 64 games played) for the Greyhounds. He scored a goal in each of his sophomore and junior season and was a two-year captain. North Attleboro’s Josh Ocel was named an All-American by the National Soccer Coaches Association for the second straight year. Ocel, who earned third team honors this season, was the team’s leading scorer with six goals and 15 assists – the fifth most assists in all of Division III. His 15 assists were also just one shy of Brandies’ single season record. Read more about Ocel’s season and Brandies’ Final Four run here. Foxboro’s Sawyer Fleck was earned All-Massachusetts State College Athletic Conference honors for the second straight season playing for Bridgewater State. Fleck was named to the All-MASCAC Second Team after scoring a goal and notching a team-best four assists. He is tied for sixth in the conference with his four assists. In 77 career games, Fleck has two goals and 13 assists for 17 points for the Bears. Foxboro’s Brian Bortolotti scored two goals and had an assist this season and Milford’s Justin Borges scored his first career goal. Former Oliver Ames standout Adam Borberly ranked near the top for minutes played for Colby-Sawyer this season. Borberly started 15 matches this season, playing over 1,000 minutes while registering three goals and three assists. In four years, Borberly started in 59 matches for the Chargers. North Attleboro’s Justin Freitas was named an All-American by the United States Collegiate Athletic Association following another outstanding year for Dean College. Freitas was named to the second team following a season in which he scored 16 goals – three of which were game-winning tallies – and had six assists. Attleboro’s Kyle Lameiras scored three goals and had three assists in 18 games played while Matt Rodrigues, another former Bombardier, had an assist from his outside back spot in 10 games played. Despite playing in just two games because of injury during his senior season, OA grad David MacKinnon had a memorable career at Hartford. 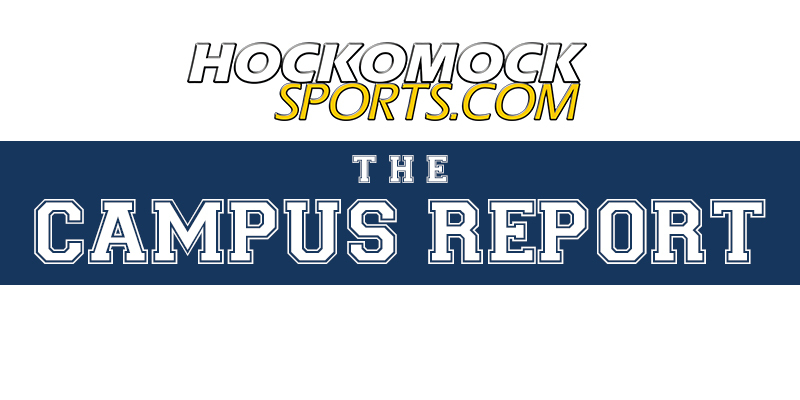 The inaugural HockomockSports.com Boys Soccer Co-Player of the Year was named to the America East All Conference Second Team his sophomore year and was named to the All-Rookie team in 2013. He set the program record for shutouts in a single season during his freshman year with nine. He ranks second in Hartford history in career shutouts (19) and fourth in career victories (25). 2015 HockomockSports.com Boys Soccer Player of the Year Devante Teixeira saw plenty of time in his rookie season at Southern Connecticut. Playing in 15 of 17 games, Teixeira notched his first career goal and added one assist. He had a clear attacking mindset, uncorking 25 shots – second on the team. Attleboro’s Alain Laurent finished the year with a goal in 17 games played. Oliver Ames alum Keegan Nutt was just one of four players – and the only freshman – to start every single game for the Stonehill Skyhawks in 2016. Patrolling the center of the pitch, Nutt scored his first career goal in September against Franklin Pierce and had two assists – one against Saint Anselm and one against Assumption. 2015 HockomockSports.com Best XI selection Joe Kellett played a major role in UMass Lowell’s historic season. Kellett was named to the America East All-Rookie Team. Kellett started all 16 games and was only off the field for a total of 12 minutes during his freshman campaign. The midfielder tallied the game-winning goal against Vermont in October and had an assist on the game-winning goal against Boston College later the same month. Franklin product Joe Kalil was selected to the Commonwealth Coast Conference First Team after another great season for Wentworth. Kalil has helped Wentworth post five shutouts and on the offensive end, has scored four goals and an assist for nine points. For his career, he has started 53 of the 55 games in which he has played in. Kalil has 10 goals and a pair of assists for 22 points in three years. Canton’s Connor Erickson led Wentworth to a 13-4-4 record in his fourth year – the team has 28 wins in past two years alone. Three former Hockomock players saw a lot of action for the Assumption women’s soccer team this Fall. Taunton’s Tayla Morais and Franklin’s Alexis Stowell each appeared in all 18 games for the Hounds, with Morais getting the starting nod twice and Stowell on ten occassions. 2016 HockomockSports.com Player of the Year Victoria Stowell appeared in 16 games for the eight-win Greyhounds. Alexis Stowell was third on the team in points with two goals and one assist while Morais added one goal. Franklin’s Nicole Ellin is becoming a mainstay on Bard’s backline. As a sophomore, Ellin started in all 17 games and played 1,277 minutes on the season. On nine occasions, Ellin went the full 90 for the Raptors. In two years, Ellin has started in all 34 games possible for Bard. Former Canton standout and Hockomock League MVP Lauren Berman started all 19 games for Boston College this Fall. She was fourth on the team in points with 16, behind only All-ACC selections McKenzie Meehan and Hayley Dowd. Berman led the Eagles in assists with eight, while scoring four goals. She was third on the team in minutes player (1,572). Jamie Grinavic finished her collegiate career by helping Bentley earn its most wins in a season since the 2003 season. Grinavic has been making an impact on the offensive end for the Falcons since her freshman year – she’s scored at least one in every season. The former North Attleboro Rocketeer finished with five career goals and four assists for 14 points. Taunton graduate Alana Vincent had a terrific rookie season for Bridgewater State and was named to the Massachusetts State Collegiate Athletic Conference First Team. She led the team with six goals and 13 points in 17 games; two of her six goals were game-winners. Vincent finished third in the MASCAC in goals and sixth in points. Mansfield’s Molly Shield (one goal) started in 18 games and Katie Bongarzone started in all 19 of the team’s games – just one of five players to do so. Former Milford Scarlet Hawk Kaley Pratt made a big impact off the bench for Eastern Connecticut State for this season. Despite starting just one of 18 games played, Pratt was third on the team in scoring – netting five goals with three assists for 13 points. Stoughton’s Rachel Berkowsky was in a similar situation, coming off the bench in 14 games to net four goals and one assist. Berkowsky set the school record for fastest hat trick recorded. She scored three goals in a matter of 4:46 in a win over the University Southern Maine in October. Former Oliver Ames product Nicole Taylor was selected to play in the New England Women’s Intercollegiate Soccer Association Senior Bowl following another great year at Endicott. Taylor started all 15 matches that she played in, missing time briefly for an injury. The co-captain finished her career with 28 starts in 48 matches played, making 27 of those starts over the last two seasons. Stoughton’s Shelby Sprague was named to the NJCAA All-Region 21 First Team following another explosive season with Massasoit. 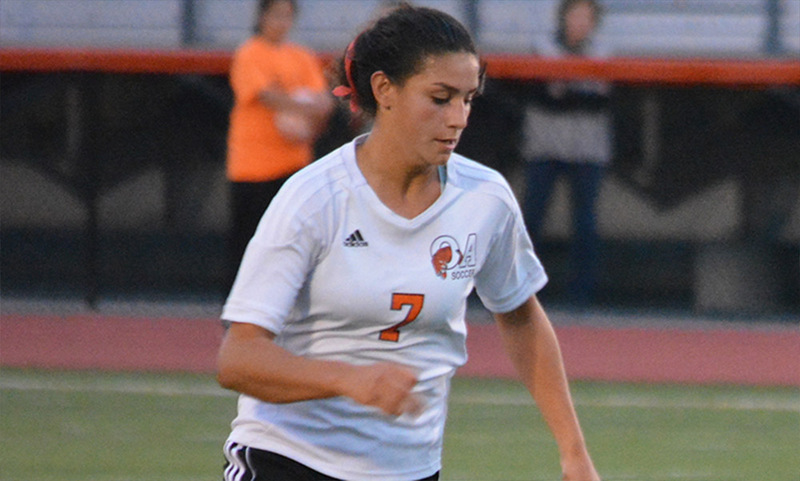 Sprague scored 30 goals, topping Region 21 and ranking third in the nation. She also added six assists to give her 66 points, also ranking third in the country. She finished her illustrious career with 55 goals, 10 assists for 120 points. This marks Sprague’s second All-Region 21 First Team selection. Stonehill’s Brianna Duserick was named to the New England Women’s Intercollegiate Soccer Association Division II All-New England First Team. The Canton product was part of the back line this year that held opponents to 19 goals against, while also being part of the Skyhawks’ offense that has scored 39 goals in the 22 games this season. She scored one goal this year, making her career total to two with one game-winning goal. Duserick led the team with five assists this year, ranking eighth in the conference, totally six in her career. It seems like just yesterday that Franklin’s Kristi Kirshe was scoring in the MIAA D1 State Final to help the Panthers claim their first title in program history. Now, Kirshe has finished her collegiate career with a NCAA DIII National Championship (2015) and her name attached to a couple of school records at Williams. For a terrific senior season, Kirshe was named to the NSCAA All-American First Team. She had 26 points during her senior year, including a team-best 12 assists. She finished her career with a school record 114 points (43 goals, 28 assists in 86 games). Canton’s Elizabeth Hamilton had a successful freshman year for Johnson & Wales volleyball and was named to the Great Northeast Athletic Conference Third Team. The former HockomockSports.com Player of the Year was fourth in kills on the team with 202 and had the most assists for an attacking player with 40. She added 34 blocks (fifth on the team), was second on the team with 302 digs and had 37 aces. Attleboro’s Michelle Sheehan made an impact during his freshman year with Mass. Maritime. The former Bombardier was second on the team with 240 assists. The freshman also had 194 digs and 51 kills for the Buccaneers. In her sophomore season at Salve Regina, Canton grad Erin Proctor was second on the team with 339 assists in just 38 sets played – an impressive 8.92 assists per set. She added 99 digs and even chipped in with 14 kills. The sophomore had a season-high 57 assists in September against WPI. Another former Canton standout, Chidera Nwankwo was second in kills for a young Suffolk squad. The sophomore had 138 kills with a team-high .238 attacking percentage. The middle hitter was second on the team with 43 blocks. Taunton’s Alyssa Gibson added 18 kills and eight blocks in her freshman season. UMass Boston’s Julia Murphy was named an All-American by the Volleyball Coaches Association – one of three players from UMass Boston. After being named an honorable mention for the honor the last two years, Murphy was selected to the Second Team. Murphy was also named the Little East Conference Offensive Player of the Year for the fourth straight time – the first time in history a player has accomplished that. Murphy’s senior campaign has seen the Canton native set new program marks in solo blocks, block assist, total blocks, while also hitting a career-high .409. In 32 matches played, Murphy sits with a career-high 339 kill. She also boasts 42 solo blocks and 65 block assists for an impressive 107 total blocks. King Philip alum Brigid Murray posted an impressive 712 assists this season while serving as Westfield State’s primary setter. She helped set up an offense that had 903 kills and 13 wins. Younger sister Micaela Murray made a splash in her first season by leading the Owls with 69 aces. During her sophomore season, former Taunton standout Lauren Murphy had 55 kills for Worcester State. Former Mansfield standout Lauren Beecher recorded 95 kills during her junior season for Dickinson. Canton star Avery Devoe made a big impact with DI Ball State, notching 115 kills in 2016. At WPI, the Engineers had three former Hockomock players help lead the way to a 22-win season. KP grad Melissa Daigle had 117 kills, 56 digs and 14 blocks. Franklin’s Shay Feeley was the primary setter, finishing her senior season with 491 assists and 173 digs. It was only fitting that the NCAA Division II National Championship and semifinals were hosted at Stonehill College in Easton. After all, there were plenty of familiar faces in the Hockomock town. In a semifinal matchup between LIU Post and Saint Anselm, there was a combined six former Hockomock players on the field. OA’s Molly Cunha played in 17 games for LIU Post, who lost in the finals. Saint Anselm has plenty of Hockomock players. Former Franklin standout Elizabeth Alie was named NE-10 Defender of the Year and also earned Longstreth/National Field Hockey Coaches Association All-American First Team Honors. Alie helped anchor a defensive back line that finished sixth in the country and second in the NE-10 in goals against average (1.02). Alie leaves the program having started all 75 games she has played in while helping the team improve from giving up 2.60 goals per game her freshman year, to the program-best 1.02 GAA the Hawks posted this season. 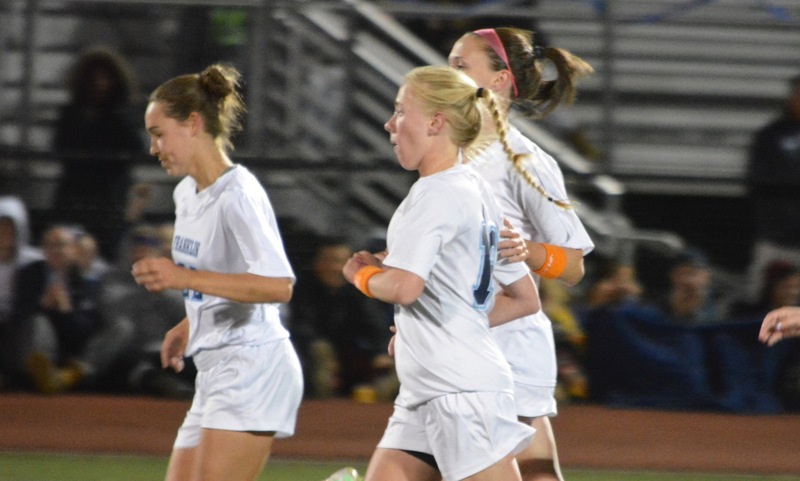 Oliver Ames’ Hannah Friend, a former HockomockSports.com Player of the Year, was tied for first in goals scored for the Hawks with seven. North Attleboro’s Rose Mooney was next on the team with six goals and three assists and Franklin’s Maddie Bressler followed her with four goals and five assists. Canton’s Mary Nee saw action in 19 games as well and recorded one assist. For the second straight year, Canton’s Mary McNeil earned Longstreth/National Field Hockey Coaches Association All-American honors. As a star player for Merrimack, McNeil earned First Team All-American honors following a season in which she led the Warriors in assists with seven and ranked third on the team with seven goals and 21 points. Her assist total was also tied for second in the NE-10 this season. Franklin’s Hannah Magerman added three goals and two assists for the Warriors, while Canton’s Lindsey Nolte and Milford’s Jess Palmer – both freshmen – saw action this season. Former Foxboro star Katie Notarangelo continues to rack up recognition at the next level. Playing for MIT, Notarangelo was selected to the New England Women’s and Men’s Athletic Conference First Team for the second straight year. Patrolling the midfield, Notarangelo helped generate a 341-171 margin in shots, a 224-106 advantage in shots on goal, and a 200-97 difference in penalty corners. She contributed to a defense that produced a 1.32 goals against average, which ranked second in the NEWMAC. Offensively, Notarangelo found the back of the net twice. Regis College claimed the New England Collegiate Conference championship back in November with Oliver Ames product Yvonne Abate playing a big role. After Elms College took a lead in the first half, Abate stepped up to take a penalty stroke and beat the keeper to level the score. Abate was selected as the tournament’s Most Valuable Player. Stoughton’s Ashley Chipman also started for Regis in the win, her 11th start of the season. Chipman finished tied for second on the team with six goals. Former Franklin Panther Sammy Rondeau earned conference honors after a strong Fall season for Simmons. Rondeau was selected to the Great Northeast Athletic Conference Second Team after ranking among the GNAC’s top top in points (23, 9th), goals (nine, 8th) and assists (five, 7th). The junior was one of two Simmons players to start all 19 matches and scored three game-winning goals for the sixth-most among league leaders. The forward registered at least one point in eight contests, including a career-high of six on two goals and two assists against Nichols. A trio of former Hockomock players helped Springfield College pick up nine wins this Fall. Mansfield’s Allie Skinner started in 18 of her 19 games played, even registering an assist from her position on defense. Hannah Boylan, another former Hornet, started in 15 games, scoring a goal against Mount Holyoke. North Attleboro’s Emily Knobel saw action in 16 games, scoring two goals and adding three assists. At UMass Dartmouth, a pair of former Hockomock players helped the Corsairs win seven games this season. Offensively, Taunton’s Katelin Morrissey was second on the team with 20 points – scoring eight goals and adding four assists. In goal, Franklin’s Allison Burke started five games and made a team-high 48 saves for a team-best .774 save percentage. Oliver Ames’ Carly Cidado had a successful first year at WPI, finishing the season as one of the top scorers for the Engineers. The former Tiger had four goals – tied for fourth best on the team – and three assists, totaling 11 points, best among any freshmen or sophomores on the team. Bridgewater State University might have been the biggest beneficiary from the Hockomock League across all sports. Both the men’s and women’s cross country teams received a big boost from a Hockomock grad. Taunton’s Trevor Wysong had a fantastic rookie campaign for the Bears and was named MASCAC Rookie of the Year. At the MASCAC Championships, Wysong finished the 8k with a time of 26:33, good enough for fourth. For the girls, Milford’s Jenise Madden was also named MASCAC Rookie of the Year. She finished the MASCAC Championships (5k) in 19:40. Below are the official Hockomock League Girls Soccer All Stars, selected by the coaches in the league. FRANKLIN, Mass. – Hana Caster was the only player to score a goal against the Franklin defense during the regular season. On Sunday afternoon at Pisini Field, Caster also became the only player to score against the Panthers in the postseason and in the process knocked Franklin out of the tournament in the Div. 1 South quarterfinal. Caster scored just nine minutes into the game to give North Attleboro a lead that it would never relinquish. The 1-0 victory advances the Rocketeers into the semifinal and ends Franklin’s streak of sectional final appearance at three (and four of the last five). 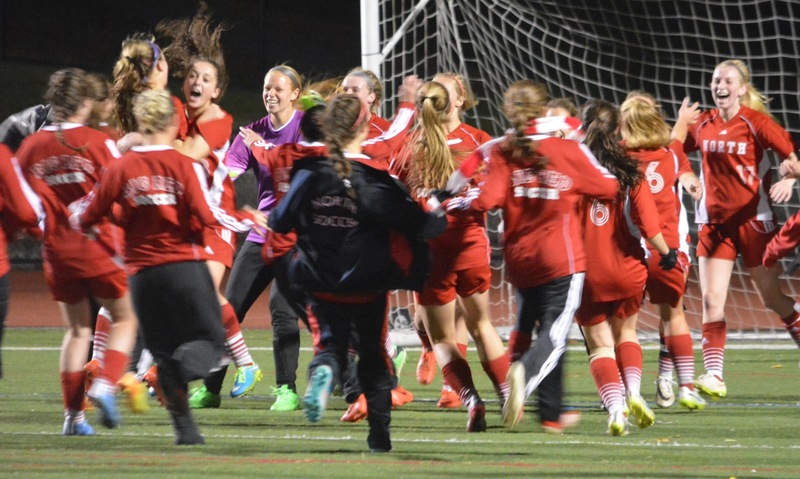 If there were any nerves going against the league champions, North Attleboro certainly hid them well. The Rocketeers, coming off a 3-2 win against Davenport champion Oliver Ames, started well with pressure in the midfield and quick transitions to the front two of Haley Guertin and Caster. In the ninth minute, the pressure paid off when Guertin sprung Caster down the right channel only for the senior forward to hit a tame shot at Franklin keeper Dani Lonati. The ball was quickly heading back towards the Franklin goal and Grace Guertin flicked a header towards Caster who split the central defenders with her speed and then composed herself to chip Lonati. “She’s a huge impact to our offense the way she’s moving the ball,” said Pasquel. North continued to pile on the pressure and in the 15th minute, Ellie Teixeira was forced to clear a ball of the line. Franklin had a chance in the 29th when left back Abigail Gipson crossed but barely missed the head of Molly Duncan and the toe of Meghan Doherty. In the 34th minute Alexis Stowell went on a long, weaving run only to hit a shot from the edge of the box right at North keeper Kiersten Bixby. The lack of sustained attack for Franklin was putting extra pressure on the defense to step up and just four minutes after the break, North almost doubled the lead. Haley Guertin got behind the defense but with the goal at her mercy dragged a shot narrowly wide. In the 54th minute North again came close to the back-breaking goal when a ball was played over the top to Caster and she showed off her speed to outpace Lauren Rudolph. With only Lonati to beat, Caster elected to square the ball and it was cleared. Two minutes later, another ball was played behind the defense and bounced toward Lonati. Caster never gave up the chase and there was a terrible collision between the keeper and the forward. Caster took a blow to the head and was down for several minutes before walking off with assistance. She would not return following that very scary moment. Franklin knew that it had to press for an equalizer and the attack started to create more chances and to push higher up the pitch. The problem for the Panthers was that every time Victoria Stowell or Emily Spath or Meghan Georges got any momentum Rachel LaBonte was there for North to sweep up and to lear the attack. The best chance for Franklin came in the 71st minute when Gipson stepped into a full volley off a Stowell corner but hit it right into the chest of Bixby. A yard either side and the game would have been tied. The clock wound down to nothing, the final whistle sounded, and for the second time in four days, North Attleboro raced onto the pitch to celebrate a victory at the home of one of its rivals. Geysen struggled to put into context all that his senior class had accomplished in four years at Franklin. From a state championship as freshmen to three straight sectional finals (in one of the most competitive brackets in the state) to four straight league titles, the seniors had a lot for which to be proud. North Attleboro will face Whitman-Hanson in the Div. 1 South semifinal on Veterans Day at Marshfield High. FRANKLIN, Mass. – There was little energy on the pitch, the passing was far from crisp, chances were practically non-existent and it seemed like both teams were grateful that halftime was only nine minutes away so they could try and regroup. It was exactly how visiting Walpole and coach Bill Wallace wanted the first 31 minutes to go. Then Victoria Stowell stepped up and curled a corner kick into the top corner to give Franklin the lead and changed the outlook for both teams at halftime. The goal stood as the game-winner, but also sparked a much-improved second half for the Panthers who ran out 3-0 winners and advanced to face league rival North Attleboro, which Wallace used to coach, on Sunday in the Div. 1 South quarterfinal. There were chances in the first half, but all came within a four minute span. First Victoria set up her sister Alexis with a corner to the far post but the forward could not keep her header on frame. Two minutes later, Walpole had a golden opportunity when Franklin’s normally rock solid defense allowed a player clean through on goal, but she dragged her shot wide of the post. The Rebels had another chance shortly after when Meghan Dieterle and Dani Lonati had a miscommunication on a throw that bounced to Tayla Randall but she steered her header wide as well. It was easier to calm down after Stowell’s “Olimpico” and at halftime Geysen reinforced his message that the Panthers needed to get back to playing their game. Walpole was forced to come out of its shell a little in the second half and chase a goal, but also the Panthers started to move the ball with more purpose and make more runs off the ball to create scoring chances. Victoria Stowell had the first chance on a free kick that skimmed the crossbar on its way past. Three minutes later and Alexis Stowell almost finished off a long throw by Ellie Teixeira, but Walpole keeper Kaitlin Brown did well to block. Teixeira had a chance of her own after a good run forward by left back Abigail Gipson opened space in the middle but again Brown was on hand to make the save. Molly Duncan also had a chance from long range that forced Brown to back pedal and tip the shot over the bar. With eight minutes to go, Alexis Stowell doubled Franklin’s lead. There was a mad scramble in the box, with several shots blocked by Brown and/or her defenders, and the ball popped loose to Stowell who managed to squeeze it inside the post. Walpole had created no scoring opportunities since the opening minutes, so the lead looked safe, but Meghan Doherty ensured the win with a deflected shot from the edge of the box that gave Brown no chance. Franklin will host North Attleboro at 4 p.m. on Sunday.